This past weekend, I had the opportunity to give my first academic presentation. 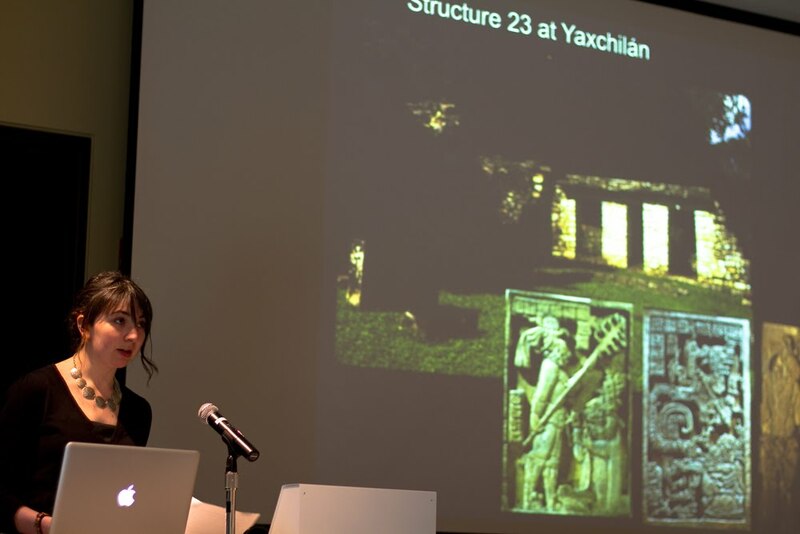 Yes, I managed to stand (that alone was tricky enough) in front of a room of sweater-clad, book-toting, eye-glass-wearing academics and present my research on three Maya relief sculptures. Yikes. Looking back from the more comfortable post-talk perspective, I have to say it was one of the most thrilling and rewarding experiences I’ve had in college so far. For those who don’t know, I was invited to speak at the UO Art History Department’s annual symposium. That’s me below. It’s hard to look suave with your mouth open. The theme this year was “Art and Ritual,” which felt like the perfect fit for my work on bloodletting rituals in Maya sculpture. Hooray for me – I was one of seven students (bachelors, masters and doctoral candidates) chosen to speak from a national call for papers. If have to pick one thing this experience taught, it’s that crafting a presentation is a lot more difficult than I expected. I read as many articles, blog posts and tip sites as I could find on creating and presenting a spoken paper, all of which provided me with at least one insight I would have never thought of before. I also realized that while this was a wonderfully nerdy niche symposium, I learned some skills about preparing a talk for an audience that could extend into any future situation. Whether you’re crafting a presentation for academia, a client sales pitch or an informal class talk, I believe there are some general tips that can help. So while I may not be a seasoned professional (yet), I thought I would contribute my top five takeaways from my experience. Some I did well. Some I will do better next time. I am a planner … For better or for worse. In this case, my need to feel prepared served me well. In addition to your talking points or scripted speech, have a list of things that might come up. What questions could people ask? What are additional facts that are interesting, but may not flow in your presentation? Remember, no matter how much you may rehearse, something may not go to plan. Be mentally prepared for anything. I was called up to speak twenty minutes before I was scheduled to begin. The trick is not to let it get to you. I knew I had my speech down, and I knew my slides were ready to go. Prepare for what you can, and be ready to let the rest go. This advice was offered by my incredible professor/mentor. Of course, this is more metaphorical than literal. Begin your presentation with a bang to grab the audience’s attention. A boring introduction suggests it will be a boring talk, so convince your listener from the start that there is a really good reason to listen. I like to compare it to a movie preview – it really just summarizes the film, but uses words with just enough drama to get you interested. You have to commit to yourself. If you feel unsure of what you’re presenting, the audience won’t want to listen to your argument. I received some great advice from Paul Viel, who said, “Remember, they are totally interested in everything you’re saying.” It’s tough to build up the confidence to mentally expose yourself to a room of people, but I convinced myself that everyone would be as captivated by my topic as I was, which helped me keep up the energy and enthusiasm to make it through. Practice in front of anyone and everyone you can. Believe me, I know that Mr. Desk and Mrs. Pillow are a far more comforting audience, but they don’t offer the feedback, or even the pressure, that you need to succeed. I felt pretty satisfied with myself a few days before my talk … and then I spoke in front of seven people and had the rude awakening that I talk way too fast, it’s really hard to read a script while you’re standing, I have a tough time articulating specific words, and that I was a lot more scared than I thought I would be. My trouble spots stuck out like neon signs under the pressure of having a few people standing in front of me. Even if your material is perfect, it’s helpful to get used to the feeling of others watching you speak. Wait … there’s a screen behind me? Even in a more formal, scripted environment, it’s still important to interact with the images on the screen. This is something I probably could have done better at. I had rehearsed enough to be able to look up from my paper, but when it came to use the laser pointer I received at the podium, I was lost. I think some of my points could have been clearer, or at least more exciting, if I had been able to engage with the images behind me more. If you are glued to the podium, at least remember to let your body express what you’re saying. All in all, be yourself. Presentations can be tough, but well worth the work. After proving my academic worth to the symposium attendees, I feel a bit more relaxed in a room of peers. So buck up and show the world what you have to offer.